Clark County Quilters makes an opportunity quilt each year (raffle quilt). This year, I helped to sell the raffle tickets at the Milwaukee airing of the quilts show in March 2018. Here is a picture of our quilt and a customer. Let me tell you how our opportunity quilt gets made and what we do with the proceeds. It's a 3 year process. The first year, we have a block contest. Guild members get a piece of fabric from the coordinators and make blocks according to whatever the rules and theme are for that year. For the quilt in this picture, we started with a piece of gray fabric and had to make a house block or something that represented "It Takes a Village". Shameful promotion: my block won! The second year, the coordinators sew all the blocks together and have the quilting completed. Karen Saltzberg did the fabulous custom quilting on this one. The third year we take the quilt around and sell raffle tickets. 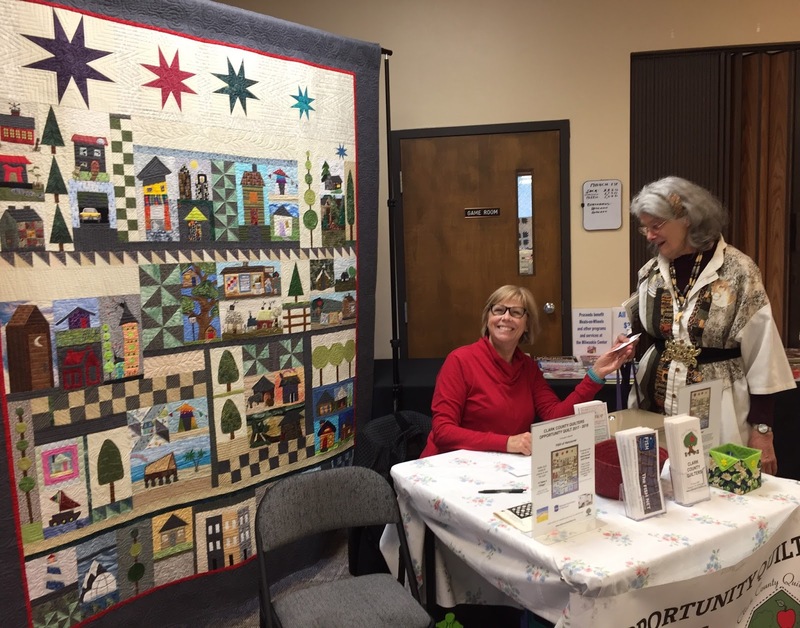 Every year, Clark County Quilters asks other non-profits in Clark County to submit proposals that explain what they would do if we gave them the proceeds. This year, we selected FISH of Clark County to receive our proceeds. In previous years, we've earned money for the Vancouver K-9 program, babies in need, and search and rescue. Each year, it is a different non-profit and we are always excited to present them with a check. I hope you take a chance at winning a raffle quilt... and maybe even it will be ours! I hope lots of tickets are sold. I bought mine. . .I hope I win!!! Of course, I always hope that!! !